^ Randy Poe. Skydog: The Duane Allman Story. Backbeat Books. 1 August 2008: 225. ISBN 978-1-61713-487-6. ^ Stephen Taylor and Matthew Jennings. Macon. Arcadia Publishing. 2013: 123. ISBN 978-1-4671-1115-7. ^ Mitchell K. Hall. The Emergence of Rock and Roll: Music and the Rise of American Youth Culture. Routledge. 9 May 2014: 157. ISBN 978-1-135-05358-1. ^ David Luhrssen; Michael Larson. Encyclopedia of Classic Rock. ABC-CLIO. 24 February 2017: 3. ISBN 978-1-4408-3514-8. ^ Ventre, Michael. 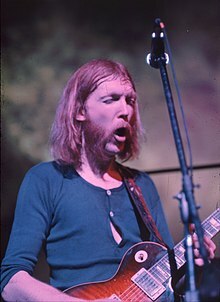 In memory of Duane Allman 35 years after his death, Skydog still among rock's very best guitarists. MSNBC. 2009 msnbc.com. October 30, 2006 [2009-09-02]. ^ His brother, Gregg Allman, said that "it would be real accurate to say that Duane was the father of the band, He had a lot to do with the spontaneity of the whole thing. He was like the mother ship. Somehow he had this real magic about him that would lock us all in, and we'd all take off. He really had that quality about him. Those were very happy days." Jas Obrecht, "Duane Allman remembered", Guitar Player, October 1981, Vol. 15, no 10. ^ This may be a reference to his signature guitar sound and tone. Many consider "Skydog" a variant of the nickname "Skyman" given to him by Wilson Pickett during the recording of Pickett's cover of the Beatles' "Hey Jude." Jim Dickinson was quoted in Keith Richards' autobiography Life as saying he was given the name because he was high much of the time.